Karnapura Kavi then highlights the most amazing Rasa Lila solo dance performance of one confidential sakhi of Srimati Radhika. Because the esteemed author does not name that gopi, that special sakhi could be Lalita, Visakha, Citra or perhaps Rangadevi. 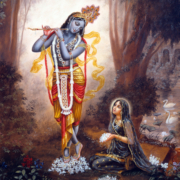 Every reader and commentator on the Rasa Lila will see Krishna’s divine love dance according to his/her own angle of vision [drsti-kon], heart’s devotion and spiritual realization. Being in the Gaudiya Vaisnava spiritual lineage of Sri Advaita Prabhu, we choose to see and will now present that this “special gopi” is none other than Sri Visakha sakhi, our personal sakhi leader, yutesvari. Thus we present Sri Karnapura Kavi’s most beautiful portrayal of the amazing solo dance of Srimati Visakha-sakhi. “As the voices and instrumental music blend in a pleasant way, Visakha-sakhi, the embodied essence of the art of dancing, stands up amidst the singers to appear like the corolla center of a flower surrounded by golden petals. When the beat drops off, Visakha-sakhi appears like a devata making a sudden appearance amidst the clanging of musical instruments. Visakha-sakhi’s waist is very thin waist and her breasts are heavy and swollen. While bending her delicate left and right hands to display the ardhendu (half-moon) and padmakosa (lotus bud) mudras, Visakha-sakhi glances slowly from right to left. Perspiring profusely, her body seems to be as soft as molten wax as Visakha-sakhi moves gracefully executing the most intricate dance steps. According to the proper method, Visakha-sakhi extends and contracts her arms while touching her waist, forehead, neck and knees, and forming mudras such as hamsasya. Dancing in this way, Visakha-sakhi’s waist becomes even thinner and her breasts more firm. Her braid licks her heels and the three lines on her belly disappear. When the beat stops, Visakha-sakhi waves her hands in the air and suddenly bends her back in such a way as to conquer the beauty of the campaka flower bow of Cupid. Fixing her knees firmly on the ground and stretching her arms out to the sides, Visakha-sakhi twirls around with lightning speed. Her ornaments jingle, her necklace and earrings swing, and swarms of bees circle around, being attracted by the fragrance of her mouth. Visakha-sakhi appears like a golden wheel spun rapidly by a mad potter. The combination of the pale luster of her gold necklace, the redness of Visakha-sakhi’s lips, and the blackness of the bees make an extraordinary picture. While contracting her belly, dropping her sash, and expanding her breasts, Visakha-sakhi digs her toes into the earth, straightens her legs and raises herself on her feet. Clenching her fists and pressing her thumb against her breasts, Visakha-sakhi recites the bol “tat-ta, ta-thai, tiki-da, tiki-thai in unison with the beat while ringing her bangles and ankle-bells. When the song finishes, Visakha-sakhi suddenly disappears from the center of the circle and positions herself on the circumference of the rasa mandala. While the voices, vinas, flutes, karatalas, and mrdangas resound, Visakha-sakhi stands behind the singers, resting rests her arms on the shoulders of a friend. While chewing betel nut, Visakha-sakhi extends her legs so that a manjari can untie the strings of her heavy, dancing ankle-bells. To relieve Visakha-sakhi’s fatigue her manjaris fan her with their shawls. Her breasts heaving, Visakha-sakhi takes a few deep breaths and falls asleep with her head on the tender lap of a blessed manjari. After resting for some time, Visakha-sakhi hears the singers expertly recite the alapa to introduce a new song. Then Visakha-sakhi reenters the rasa mandala like Cupid personified. Illustrating the song with intricate mudras, Visakha-sakhi dances so enthusiastically that Siva becomes inspired to dance His perform His tandava dance. Visakha-sakhi’s thumb is supremely beautiful, her forefinger excels the pride of Cupid, her middle finger defeats the grace of the universe, her ring finger defeats the pride of Cupid’s wife, and her little finger establishes the meaning of colorful expression. Golden-bodied Visakha-sakhi appears like continually rising golden light as she twists and turns higher and higher. Visakha-sakhi appears like a stream of golden pollen stirred up by a storm amongst a group of lotuses composed of singers and musicians. As Visakha-sakhi sways in the sky like a glowing vine, she displays many complicated movements. Indeed, her unique dancing is not due to dance lessons. As the essence of gracefulness, Visakha-sakhi’s feet never touch the ground. If a group of lightning bolts from a cloudless sky remains stationary for a long time swaying in the breeze and roaring with the beat “tat-ta, ta-thai” it might compare with Visakha-sakhi’s dancing. As the beat subsides and Visakha’s footsteps lighten, she sways her body back and forth, revealing the perfection of beauty in her upper limbs. Visakha’s sakhis fear that her thin waist, unable to bear the bending, will break like a tender lotus stem. Jingling her golden ankle-bells to start, Visakha-sakhi then dances with great skill. Moving her feet to the different beats (laghu, guru, pluta, druta, drutata, and ardha drutapada), she rings ankle-bells. Sometimes Visakha-sakhi jingles only a few, and most amazingly, sometimes not even one bell resounds! Being very satisfied with Visakha-sakhi’s extraordinary dance performance, Radha and Krishna cheer, “Very good! Very good!” and warmly embrace her. Visakha-sakhi’s most astonishing and uniquely spectacular solo dance performance completely astounds all the assembled Apasaras the leading Devatas of music and dance! Radha-Krishna’s divine Rasa Lila ki jai! Srimati Visakha-sakhi ki jai! Jai Jai Sri Radhe! How to Serve Radha Kunda?